If you consider yourself to be an avid kayaker or paddleboarder, then Costa Rica may be one of your best options in the world for places to visit where you can do both. With coastlines on the Pacific Ocean and Caribbean Sea, there are hundreds of miles of shoreline to kayak and paddleboard. And with dozens of rivers flowing out of the major mountain chains of Costa Rica, you’ll enjoy year round `world class river kayaking. Before you start planning your grand adventure around Costa Rica, it’s probably best to learn a little about the country and the “must visit” places for kayakers and paddleboarders alike. For the purposes of trip planning Costa Rica is made up of six regions, all of which are quite diverse. Each region has different natural attractions, activities and most importantly, waters to explore. Here is a brief introduction to each of the regions, some information about the best waters to kayak and paddleboard, and the perfect time of year to visit. The Nicoya Peninsula is actually split between two regions, Guanacaste and Puntarenas. But the majority of the peninsula is located in Guanacaste. In the northwestern part of the country, the northern most tip of the region shares a border with Nicaragua. There are so many things to do: fishing, hiking, and even exploring the amazing rock arches and formations throughout the peninsula. 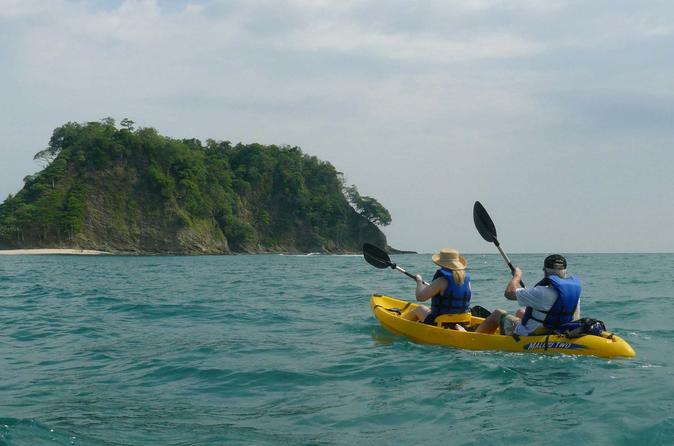 The Nicoya Peninsula is also a great place for sea kayaking and paddleboarding, and not only does it cover a large expanse of the western coast of the country, it is also known for its seemingly always sunny weather. Any time of year that you happen to visit the Nicoya Peninsula, you are bound to be blessed with beautiful weather. Along with the white sandy beaches, uniquely beautiful wildlife and the other activities that can be done around the peninsula, it is a popular vacation spot not only for tourists but for the locals as well. Though it is such a popular spot, the Nicoya Peninsula is never in short supply of quiet and uncrowded beaches, making them the perfect places to set off on your kayaking or paddleboarding trek along the Costa Rican shore. Ocean kayaking has become a very popular water sport wherever you go. Launching from the Samara Beach and heading to Chora Island is a fantastic day on the water. And to top it off snorkel gear is included. The water is crystal clear and a lot of tropical fish are visible from the kayak or below the surface. Highly recommended. This estuary flows directly onto the beach between Tamarindo and Playa Grande and into the Pacific Ocean. You will travel upstream and experience some excellent swimming spots. Also keep your eyes open for a variety of Costa Rican wildlife, including monkeys, crocodiles and many types of water or jungle birds. If you are looking for a peaceful and quieter experience for your kayaking or paddleboarding adventure, you might want to check out Lake Arenal. Lake Arenal is the largest lake in all of Costa Rica and the calm water of the lake provides a nice relaxing trek which makes it great, even for beginners and small children. While you are there, you can soak up the sun and enjoy the impressive views of the Arenal Volcano in the distance. The volcano towers almost 5,500 feet into the air and is considered to be a young volcano by scientists. Though it has considered to be dormant since 2010, its last eruption was only a little over 50 years ago in 1968. Though it is unlikely that you will be able to experience a volcanic eruption while you are enjoying your kayaking or paddleboarding, the kids will be astounded by the stories of volcanoes as you slowly paddle around the lake and enjoy the calm and quiet sounds of nature. Once you have finished your time on the water, if you are looking for some other things to do around the Arenal Volcano, there are many things to consider adding to your to do list. Between local cooking classes and the Rainforest Chocolate Tour, you are sure to discover something delicious. Canyoning, hanging bridges and natural hot springs are also a must! And of course, if you are looking for some family friendly activities, you should consider the Arenal Observatory or a hiking trip, taking a tour of the wildlife rescue center or even zorbing. The best time to visit this area is in the dry season which is basically the summer months so that you can enjoy all of the exciting outdoor activities without the fear of weather canceling your plans. Paddle through Costa Rica’s Lake Arenal. 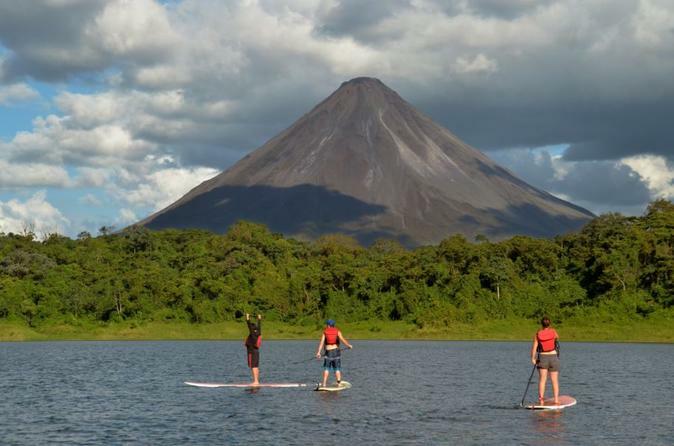 Admire from the paddleboard the best and closest views of the Arenal Volcano. The calm waters in Arenal make this a perfect sport for people of all ages and all skill levels. As you embark on a journey out to the middle of Lake Arenal, you’ll be blown away by all of the natural beauty of Volcano Arenal. You’ll board a private boat as your guide and captain load up with stand up paddleboard gear and provisions. The mountains that surround the lake are different shades of green, as some are in the foreground while the others fade into the distance. At first, the Arenal Volcano seems like it is hidden behind mountains, but if you get to a certain part in the lake you’ve reached the sweet spot – a spot where you can see the detailed textures of its rock formation and where passing in front of it can make you feel tiny. A great chance to get out out on the water off Flamingo Beach. You’ll head out from the beach to a private island where you can go ashore, swim or snorkel. You’ll enjoy clear waters and white sandy beaches. This is a relaxed and scenic kayak tour. Both single seat and double kayaks are available. Snorkel gear is provided. The Central Pacific coast has over 600 miles of coastline on the Pacific Ocean side of the country, making it perfect for sea kayaking and paddleboarding. 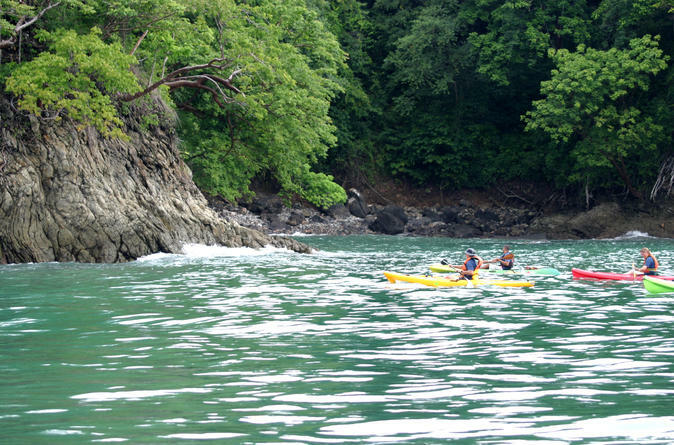 Located in the Puntarenas region of Costa Rice is the Manuel Antonio National Park. 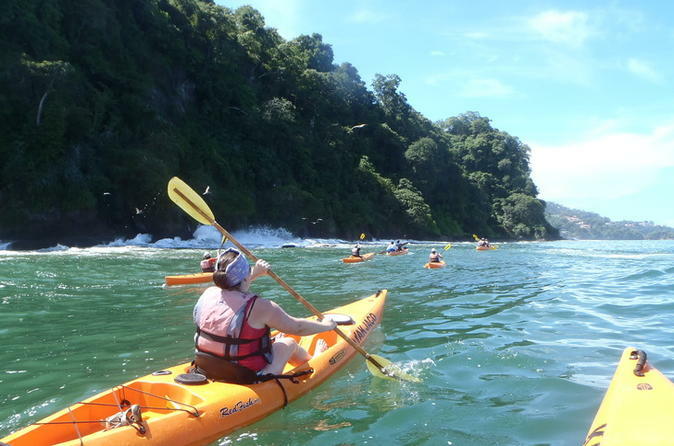 On this tour you will paddle along the coast of the famous outcropping known as the Manuel Antonio National Park. There are plenty of islands to head for or stay in a calm, quiet bay watching for fish and other sea life. You’ll eventually end up at Biesanz Beach. At this spot you can snorkel, or just relax and have a cold beverage. Included are ground transportation and a Costa Rican meal after the excursion. You can enter the national park and head toward the sea to begin your kayaking or paddleboarding adventure. Upon entering the park, you will be in awe of the thick and lush rain forest with the exotic animals and breathtakingly beautiful tropical plants. As you get closer to the ocean, you will be the stunningly white sandy beaches and the crystal clear water. If you are lucky, you may even have a chance to see the sea turtles when they come up to the shore to bury their eggs. This usually happens between September and March. 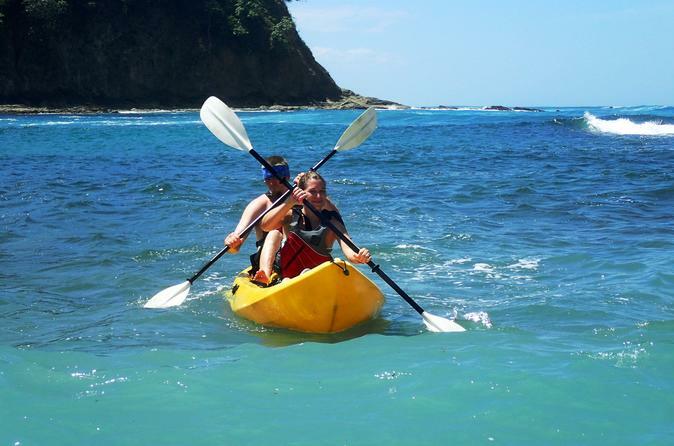 This tour allows you to experience one of Costa Rica’s most popular coastlines in an open-style ocean kayak. It’s a 30-minute paddle out to a private beach. Here, you’ll get to choose from several activities including snorkeling and a nature hike. The tour takes a maximum of 8 people so that the experience will be more private and enjoyable. Pickup from your hotel, equipment and fresh water and fruit included. If your plan is to go kayaking or paddleboarding in the Central Pacific region, you are in luck because September through March is one of the best times to go. With nice tropical weather between 60 and 80 degrees Fahrenheit and plenty of sunshine, you will certainly want to make sure you pack your waterproof camera sunblock. Once you have finished your exciting kayak or paddleboard adventure, you can continue your adventure around the Central Pacific region to check out some or all of nearly a dozen waterfalls spread throughout the region. If you are still feeling adventurous, you could go ziplining, white water rafting and even horseback riding or waterfall rappelling. If you are looking for something a little less outdoorsy, you can stop at a local cafe for some delicious locally grown coffee or visit one of the many art museums that feature the works of many native artists. There is a nearly endless supply of things to do the Central Pacific region. There are multiple rivers throughout the Central Valley of Costa Rica with varying degrees of difficulty and classes of rapids. The Upper Pacuare River is probably one to the most exciting of those rivers, with Class III to Class V rapids. This is certainly not a place for children or beginners but once you have gotten some experience going through the rapids, you will experience a new and exciting type of river kayaking. This tour is designed to highlight the biodiversity surrounding the Sarapiqui River. Along the way you should expect to see an abundance of wildlife along the river. The kayak jungle trip gives everyone a chance to experience paddling in the river and is a wonderful opportunity to practice your kayaking techniques under the guidance of a qualified instructor. Kayakers who have participated in River Runs should be able to perform eddy turns, peel outs, ferries, and unassisted self-rescues. Sarapiqui river runners should feel comfortable in class II white water. Class III river runners should be strong intermediates who are comfortable on class III water. The advanced river running clinics are more instructional than other river runs with a focus on the kayaking techniques that help you develop the skills and confidence to handle more difficult water. Costa Rica is a beautiful Latin American nation located in Central America. Located only 8 to 12 degrees from the Equator, it offers a wonderful tropical climate that you can enjoy year around. It has only two seasons: the hot and dry season which are the summer months of the Northern Hemisphere, and the wet/rainy season that is equivalent to winter. 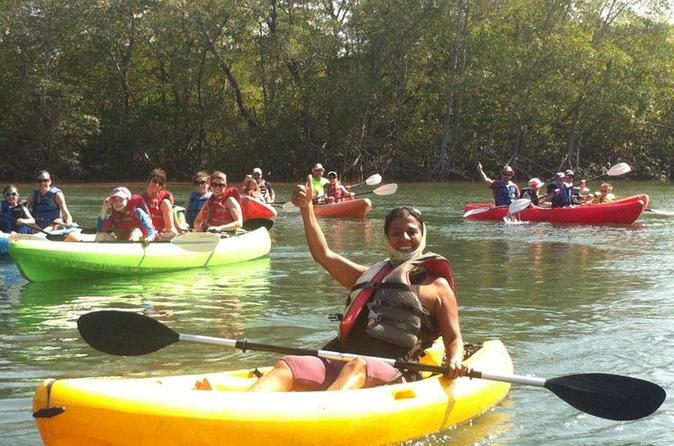 Kayaking and paddleboarding are year around sports for locals and tourists alike in Costa Rica. While you are visiting Costa Rica, you can experience the amazing sights and sounds of tropical rain forests and the amazing exotic plants and animals. You can also see firsthand the exciting culture of this Central American country while interacting with the natives, enjoying the delicious local foods and, of course, kayaking and paddleboarding your way through the country. San José is where the capital city of Costa Rica is located, also called San José. If you are flying into Costa Rica, you will more than likely fly into the San José airport, making you conveniently located near hundreds of attractions and things to do within the city alone. Some of those things include visiting the Museo de los ninos, Parque La Sabana, the Old Atlantic Rail Station, and the Jade Museum. Shopping at the central market for souvenirs and trinkets to take home from your vacation to Costa Rica is also another great way to pass the time in San José. 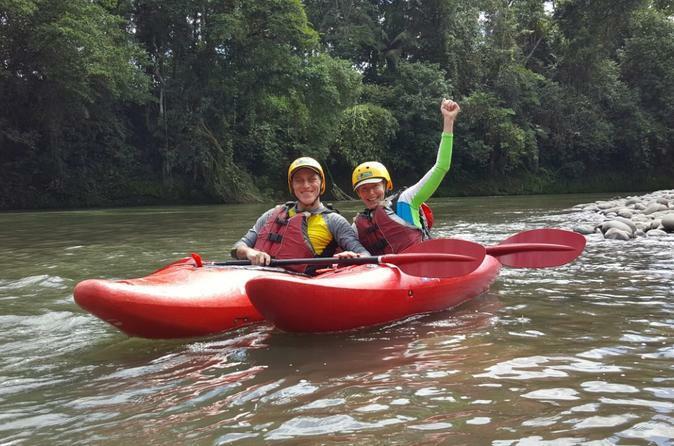 If you are looking for the real excitement, you might want to check out kayaking down the Pacuare River. The mouth of the river is actually located in Limón where it empties into the Caribbean Sea but the 108 kilometer river begins near San José. There are places for river paddleboarding and kayaking throughout the entire length of the Pacuare river. It is surrounded by rain forests with wild animals, including jaguars, monkeys and many species of birds. The stretch of river near San José includes many class III and Class IV rapids making it more than just your easy paddle downstream but also making it an exciting and thrilling place to visit. This section is known as The Upper Section and is about 16 miles long. Though mostly Class III and Class IV rapids, there are also a few easier Class II rapids to give yourself a little bit of a break here and there. You will probably want to visit the Pacuare River during the early months of the rainy season or winter months because this is when the water level tends to be higher but not too high due to flooding. Located almost in the exact center of the country, sea kayaking and paddleboarding is not an option here, but that doesn’t mean there isn’t water be paddled. If you are looking for a challenge, you might want to consider white water kayaking. Cartago is the perfect place for this. If you aren’t comfortable with the huge white water swells and long distances that the Upper Pacuare River offers, you can still catch a few rapids in the Orosi Valley. Try visiting the Lower Orosi River instead though there are still some Class III and higher rapids but the entire distance only takes about 45 minutes, making it a much easier journey than some. Don’t forget to stop at the other sightseeing locations like the Ruins of Santiago Apostle Church, the Central Market, and the Basilica of Los Angeles. With temperatures averaging between 55 and 75 degrees Fahrenheit year around, a trip to Cartago, Costa Rica is really the perfect escape any time of the year. The region of Heredia is home to the largest university in all of Costa Rica, The National University of Costa Rica. It also borders Nicaragua and San José which is where the capital is located. With a mild climate, lots of clouds and large amounts of rain between May and October, you may want to consider going to Heredia over spring break or Christmas vacation so the rains don’t dampen your trip. Day trips, city tours and cultural tours are very common things to do in Heredia. Since it isn’t located near any major bodies of water, finding a place to kayak or paddleboard is more difficult than other places in Costa Rica, in fact, it is pretty much impossible. But if you are still interested in doing outdoor activities in Heredia, you can check out the waterfalls, go on a nature tour or go hiking at the Bosqua de la Hoja. After kayaking or paddleboarding the Pacuare River, don’t forget to visit the capital city and go exploring there. This is where you can get a real taste of Costa Rican culture while still have the easy conveniences of it being a hot spot for tourists, thus making it easier to enjoy and a great place to rest after your exciting water adventures. The Limón region is located on the Caribbean side of Costa Rica and makes up the entire eastern coastline. Located in Limón is the Parque Nacional Tortuguero or the Tortuguero National Park, and as its name states, this national park is one of the main breeding grounds for the Green Turtles in the Caribbean. 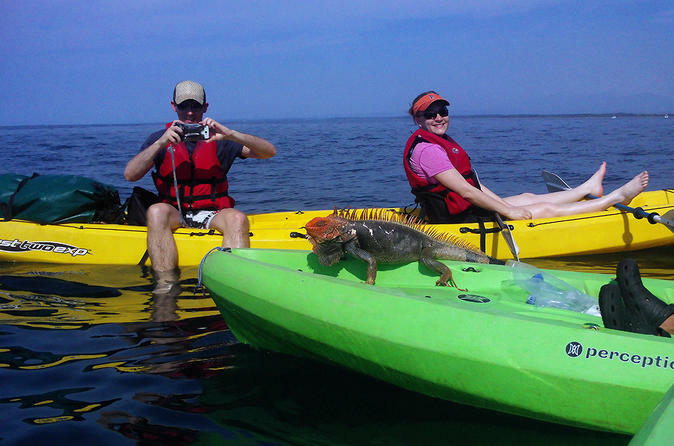 Along with other interesting wildlife like the sloth, a variety of monkeys, birds, and many reptiles, you will enjoy the journey to the waterways or coastline just as much as when you are actually on the water. While you are journeying through the national park, you should take the opportunity to hire a local guide to helping you spot uncommon and not easily seen animals and plants. To become fully immersed in the natural environment of the Parque Nacional Tortuguero, a guide will be your best friend and can probably show you the best waterways for kayaking or paddleboarding in the national park because not all waterways are created equally. Within the national park alone, there are nearly 200 square kilometers to choose from. 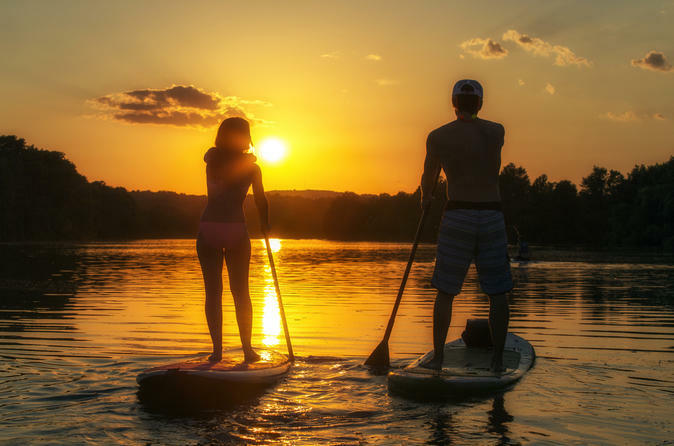 Ask a local to make the most of your kayaking or paddleboarding trip. Let’s face it, traveling around Costa Rica is like the adventure of a lifetime for many people. The advantages of doing it with a kayak or a paddleboard are numerous. One of the main advantages is the ability to access remote locations much more easily. Not only are there great rivers and lakes to check out but the coastlines are filled with hundreds of tiny islands that are only accessible by boat. The easiest and most convenient way to visit these little hidden gems is to hop on your paddleboard or kayak and paddle you way around these islands. Planning a trip to Costa Rica and going paddleboarding or kayaking for the day can be a lot of fun and a nice break from to touristy things like tours, historical things, and coffee plantations. But if you are really looking for an adventure, you can plan your entire vacation around paddleboarding or kayaking and spend a week or two or maybe even longer if you have time, and paddle your way throughout every part of the beautiful country of Costa Rica. You never know what surprises may be in store for you. So what are you waiting for? Costa Rica is waiting for you. The waters of Costa Rica are waiting for your paddle to break the surface. Start planning your trip today. Whether you are going to one region or you plan to travel around the whole country, you won’t be disappointed by the adventure that awaits you whether kayaking, paddleboarding – or both.